There are several grades of clarity which we will get into but they all fit into one of two categories. Ones with eye visible inclusions and ones with no eye visible inclusions. Those that are completely eye clean are the most desirable. SI2 and better diamonds are completely Eye Clean. 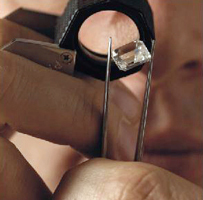 SI2 and better Diamonds require a 10x loupe to see the difference. An SI2 will look exactly like an IF to the naked eye. SI3 Diamonds will look eye clean at first but upon closer examination under 10x magnification, you might find an eye visible inclusion that you normally would not have noticed if you hadn't found it with a loupe first. This makes SI3 grade diamonds a great value for the budget conscious shopper since you can buy it for a very reasonable price and most people will never notice the inclusions during daily wear. SI3 Clarity is also a very acceptable grade for someone who wants a bigger diamond that their budget would normally allow. Flawless "FL" and Internally Flawless "IF" are the rarest and most expensive diamonds. The next grade is VVS1 and VVS2. This stands for "Very Very Small" Inclusions. Then Very Small inclusions, VS1 and VS2 and Finally Small Inclusions SI1, SI2 and SI3. This is a standard representation of the clarity scale. What it does not show you is that with the naked eye, these all look the same from FL-SI2. Also, not all the inclusions are black but that is the only way to illustrate them. Important Note: Many people falsly believe that they have to go higher in clarity to get a brighter and sparklier diamond. That is not the case. Diamond clarity is only concerned with the size, shape, color and placement of the inclusions inside a diamond as well as some external blemishes. Diamond clarity has nothing to do with how bright or sparkly a diamond is. That is determined by the diamond cut and the quality of rough used to make the diamond. As diamonds form over the course of millions of years, tiny imperfections form as well. Sometimes even other gemstones or materials get trapped in the diamond. These internal imperfections are called inclusions. If the diamond has a small scuff or mark on the outside of the diamond, this is called a blemish. Like a fingerprint, these inclusions and blemishes can be used to identify your diamond since no two diamonds are exactly identical. Diamonds are graded under 10x magnification, so diamond clarity is determined by what is shown under 10x magnification. The eyepiece used is called a loupe and should be 10x triplet corrected. If the jeweler hands you some other sort of device, he probably does not want you to see what is actually inside the diamond. If used correctly, you may be able to see more with a loupe than a microscope. It is too easy for the jeweler to hide inclusions and blemishes with the microscope holder and you are more free to move the diamond around with just a loupe and a pair of tweezers. Diamond clarity is determined by the biggest inclusion in the diamond. It is referred to as the major inclusion and the rest of the inclusions are minor inclusions. If there is a cluster of tiny inclusions, the cluster is the major inclusion. Has only very minor Inclusions that can be found with a 10x loupe. Has small eye visible inclusions that are obvious with 10x loupe and may be noticeable with the naked eye once you find them with the loupe first. Has obvious eye visible inclusions and/or blemishes that do not require 10x magnification to see. 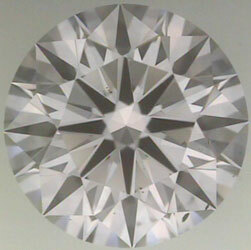 The Placement of an inclusion affects diamond clarity. Here is an example of a crystal inclusion that is black. These are commonly referred to as carbon inclusions even though the whole diamond is technically made up of carbon. This inclusion is right in the center of the table where it will be the most noticeable. 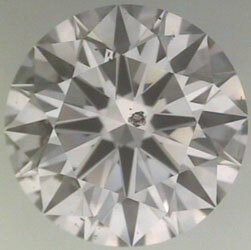 It is very possible that this inclusion may be eye visible because of where it's placement is in the diamond. 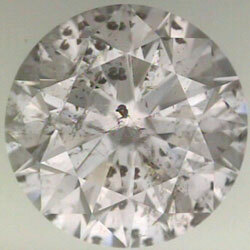 The amount of Inclusions affects diamond clarity. This diamond has lots of black crystals that are reflecting all around and making the diamond look even lower clarity than it is. Reflections can also affect diamond clarity. 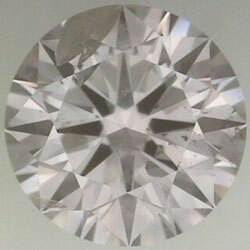 The color of an inclusion affects diamond clarity. Here is another crystal inclusion but this time it is grey or clearish in color. Inclusions can be black, white, clear or even other colors like red, yellow, green, brown or blue. Even though this inclusion is right in the center of the table, it is very unlikely that anyone would ever notice it with the naked eye. Whether an inclusion is prongable affects its clarity. This diamond has a white feather on the edge that can be partially covered by a prong. The rest of the inclusion that is exposed will usually be camouflaged. The size of an inclusion affects diamond clarity. Here we have a similar black crystal but it is smaller and it is on the egde of the diamond making it a higher clarity diamond. When an inclusion is on the edge there is more chance that it will get hidden or camouflaged by the crown facets. This is a much more desireable diamond that the one on the left. The Type of inclusion affects diamond clarity. This is a feather inclusion. They are usually clear or white in color and blend in well because they just look like another facet to the naked eye. The feather is the most popular type of inclusion affecting diamond clarity. 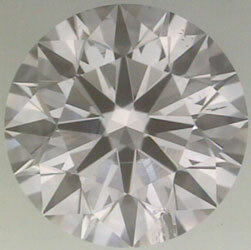 This diamond has a small clear feather that is hidden in the crown facets to the lower right. This is the author's favorite type of inclusion. 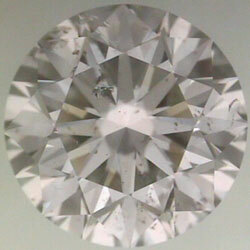 Density of inclusions affects diamond clarity. 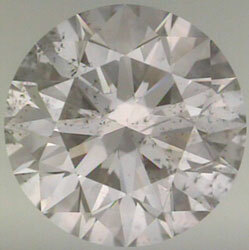 Some people prefer lots of tiny chrystals scattered throughout the diamond instead of one really big inclusion because they will be much less eye visible even though the diamond may look more heavily included under magnification. You may be suprised to know that many of the diamonds in the above illustrations have been graded the same exact grade. This happens for two reasons. One, grading is subjective and two, the diamond clarity "scale within the scale". Both concepts are covered below. In the above photographs you learned how the size, shape, color, placement and amount of inclusions can affect the diamonds clarity grade, so it should not be too hard for you to understand how one SI1 can look better than another SI1. 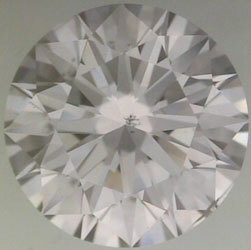 The above diamond clarity chart shows the simple cut and dry diamond clarity grades, but it fails to show the grades in between which make a huge difference in the value of the diamond. Below is a chart that shows how you should think of a diamonds clarity. By now you should be getting the idea that not all diamonds are created equal. There are good ones and bad ones that look "exactly the same on paper". That is the industry term used when two diamonds have the exact color, clarity, size shape, cut and all the other attributes. This is also one of the many reasons that you get such a broad range of prices when you search for a diamond on an online diamond database. If you would like to know the other reasons why similar diamonds can have a vast price difference, just keep reaeding this page and then browse through the links on the left under Diamond Price factors. Just when you thought you were understanding about diamond clarity, it gets more complicated. As you just learned, there are good Si1's and lousy SI1's, but that's not all. There are VS2's and even VS1's as well as SI2's and even SI3's that are graded SI1. That's right! Diamonds can be graded up to two full clarity grades different than what they really are. How is this you ask? Diamond clarity grading is subjective. Many people think of a diamond grading laboratory as an institution, but in reality it is a whole room full of different people. There may be 200 graders in the room and one guy on one end of the room has a completely different idea of a VS2 than the other guy at the other end of the room. Lots of times graders see diamonds differently on a day to day or hour to hour basis. Many factors determine how a diamond will be perceived by the grader such as if he has a cold or is thinking about what he is going to do after work. One grader may have received a ticket on the way to work in the morning and another grader may have just met the love of his life last night. You better bet, they will be grading their piles of diamonds differently that day. It is for this reason that we have Strictly and generously graded diamonds. For the reasons explained above, there are some strictly graded diamonds and plenty of generously graded diamonds on the market. Strictly graded diamond clarity: This is when the diamond is not just a good version of its grade, but actually one or two grades better than stated on the certificate. When this happens, you get a diamond on the market that seems way over priced for what it is and the jewelers NEVER stock these, because nobody ever comes in and says "what is your most expensive H SI1. The same applies for diamond color. Generously graded diamond clarity: This is when a diamond is not just a bad version of its grade but actually one or two clarity grades lower than stated on the certificate. This is the type of diamond that most jewelers stock and the ONLY ones that sell online. This is because the price seems much cheaper and it looks like a good deal. Most people go into the store and say, what's your best price on a G VS2. What they actually get is an above average price on an I SI2 with a G VS2 Certificate. The same applies for diamond color. It might suprise you to know that the author of this very diamond buyers guide website, bought a round 2.00ct H SI2 Strictly graded diamond. He paid over $22,000 for it Wholesale, but it absolutely blows away any other G VS2 you put it next to. Now if you do a search of wholesale diamond prices online for round, H Color, SI2 Clarity diamonds in the 2.00-2.99ct range, the first thing you will see is that they start at around $8400 but they go up to $27,300. If we add the lowest and the highest price together and divide by two, we see that an average round 2.00ct H SI2 should cost around $17,850. Now if we do another search for round 2.00-2.99ct G VS2 which is actually what the diamond is even though the paper says H SI2, we see that the G VS2's start at $12,250 and go up to $53,250 with the average being $37,900. The average whholesale price for a 2.00 ct average quality G VS2 (after calculating the price per carat) should cost around $25,000. He paid $22,300 for his diamond but he got a G VS2 that would have cost well over $30,000 if it had been graded that way. As you can see in the above example, the author actually saved over $8,000 on his diamond even though a paper buying price shopper would have turned his nose up at this diamond thinking it was way overpriced. The smart shopper would go for the seemingly over priced H SI2 rather than the cheapest G VS2. Got it! Good, Go get 'em.